After years of struggling to find the right fit for my AA narrow feet, I decided to take matters into my own hands and learn how to make shoes for myself. Along my journey, I encountered women with their own ‘feet stories.’ I heard about hardships of finding cool size 13 shoes, or the need to buy two different pairs for different sized feet, or people who always ‘size up’ because their feet are too wide. These stories further fueled my desire to create a shoe brand that produces shoes in many sizes and widths. I learned that it wasn’t always like this. Years ago, brands and stores made and sold a variety of sizes and widths. Overtime this changed when they decided they no longer wanted to hold inventory and the risk associated with not selling everything. NicoNine changes all that by offering customers a made-to-order experience during pop-up events online. Customers get detailed instructions on how to measure their feet and we produce shoes based on their unique measurements. To fix the inventory problem, each production run is contingent on reaching a minimum number of orders. All shoes are made to order, by hand in a women-owned, minority-owned factory in Hoboken. 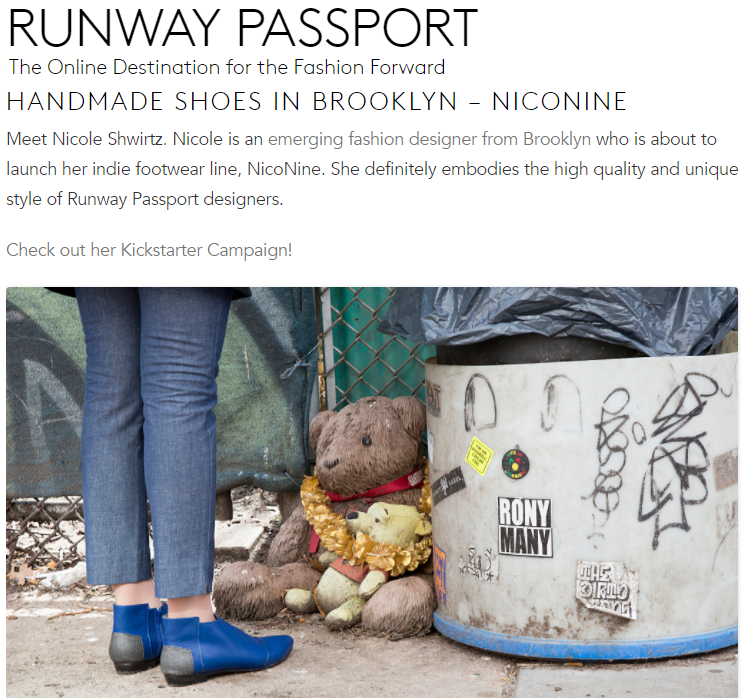 NicoNine's first style, the Athena bootie, was successfully funded through Kickstarter, in April 2017. Each pair was made to order according to the measurements provided by the customer. In some cases, extra love was added to accommodate different size feet and other foot issues. Learn more about me on the My Story page.